Parenting is the toughest job on the planet. There’s nothing like it — little to no training, steep learning curve, constant failure, and punishing hours. Building trust is essential to your success as a parent. How can emotional intelligence help parents get through the toughest parenting dilemmas? When we practice trusting our emotions, taking emotional responsibility, and balancing trust with expectations, we build the infrastructure for healthy relationship for our kids and ourselves. On a sweltering Saturday afternoon, I sit by the swimming pool, watching my two boys play in the water. I notice a toddler girl, dressed in a pink swimsuit, leaping into the pool over and over again. Her dad stands ready to catch her. She squeals with joy. Then, she jumps beyond his reach, and a look of panic comes over his face. He dashes to catch her – just in time. Her smile is pure bliss – her dad’s is one of fear and relief. The scene got me to thinking about what it means to build trust in parenting. 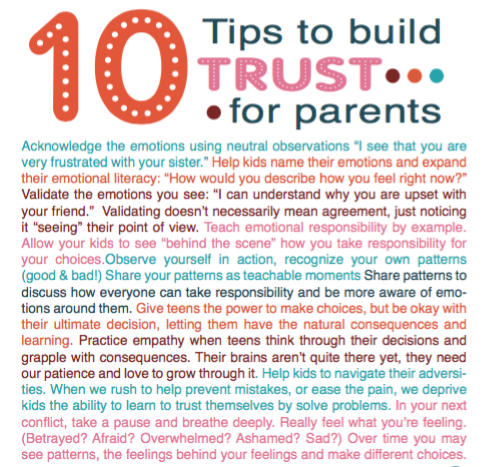 Trust is such an essential element of parenting – so fundamental that it’s difficult to talk about or define it. What was it that allowed this little girl to trust that her dad is reliable and will do the right thing? When our kids are young, emotions (theirs and ours) can loom large. Sometimes, the big emotions can be disruptive and even obstructive. Parents tend to feel stressed about juggling many tasks against the pressure of time. So when children throw tantrums and don’t do what we ask of them, we usually don’t have time to deal with these emotions, and our inclination is to move past them with bribes, threats and distractions. But in order to help our kids with building trust in themselves, we must teach them about their emotions and how emotions are messages from themselves to themselves. The first step is to increase their emotional literacy. Tip #3: Validate the emotion you see: “I can understand why you are upset with your friend.” Validating doesn’t necessarily mean that you agree with the feeling, just that you notice it and can appreciate their point of view. The neuroscience behind this last tip is that when we validate our kids’ emotions, we are giving them space to pause and feel accepted in how they feel. Meanwhile, their amygdala can cool down and then we can engage in solving the problem with them. In order to help our kids with building trust in themselves, we must teach them about their emotions and how to listen to them. At one point, the little girl at the pool bumped her knee against the wall as she was trying to climb out. She cried, but her dad didn’t come to her rescue immediately. He let her cry as she continued to climb, all the while encouraging her to keep trying. She made it over the wall. At this point, she realizes that she can get herself out of a bad situation. She learns that she is capable of solving her own problems. In this incident, the little girl is learning to trust herself. When we teach children to take responsibility for their own emotions, we are building the infrastructure of a trusting relationship. Emotional responsibility is the idea that each one of us is responsible for how we feel and how we handle our feelings. Tip #4: The best way to teach emotional responsibility is to teach by example. When you are in a conflict with another person, allow your kids to see “behind the scene” how you take emotional responsibility for the situation. Tip #5: As we tune in and notice, observing ourselves in action, we can better understand our choices. Then we will recognize the patterns that are productive and those that are not. As a family, share your patterns with one another and ask what others observe about yours. Tip #6: Brainstorm ways each person can take responsibility for their patterns. Being more aware of our emotions and taking responsibility for them will teach our kids about consequential thinking. When we teach children to take responsibility for their own emotions, we are building the infrastructure of a trusting relationship. One day, seventeen year old William asked his dad if he could go to the movies with some friends. His dad initially said no, but a couple of hours later, William was told that he may go if he wanted and, and it’s his decision to make. William doesn’t completely trust that it’s his decision to make. Based on past experiences, whenever he is given a choice to make his own decision, there is usually a “right” answer that will make his dad happy and a “wrong” answer that will upset him. Sure enough, when William decided to go to the movies, his dad said that he was very disappointed in William’s decision. Tip #7: When we give our teens the power to make a choice, we have to be okay with the ultimate decision, even if it’s not what we had hoped for. To ensure that their decision is acceptable, make sure that you are okay with all options on the table. Limit their choices until you are confident in their decision-making. If William’s dad was not going to be okay with him choosing to go to the movies, then he should not have given him the decision to make. Tip #8: As parents, we all know that teen’s consequential thinking is not developed fully due to their prefrontal cortex. So we need to practice empathy when it comes to expecting our teens to think through their consequences. We need to help them apply consequential thinking, which is the concept of weighing pro’s and con’s, long-term vs short term, self vs. others, etc. in a decision-making process. It’s in this practice of balancing boundaries with freedom and expectations with acceptance that we build a strong foundation of trust. Perhaps, if William and his dad sat down to talk about the consequences of each option, William might be better equipped to make choices that his dad would be satisfied with. Tip #9: Perhaps helping our kids to navigate adversity is one of the most difficult thing to do as a parent. For most parents, the natural instinct when our kids encounter challenges is to step forward “to show them the way” or “to prevent them from falling”. When parents rush to help, prevent mistakes, or ease the pain, we deprive our child of one of the most effective ways to learn to trust themselves by solving their problems. We also send a message that we don’t trust them. Tip #10: On the journey of parenting, there will undoubtedly be many ups and downs and new and unfamiliar circumstances in which we will not know how to parent. We will feel unequipped and daunted by the many issues we confront. One of the best way to deal with the tricky waters of parenting is to learn to navigate our own emotions. When you start to feel anxious and stressed out about your role as a parent, take a pause and breathe deeply and acknowledge what you are feeling. Then go back to Tip #2 & Tip #3 and start to label and validate your emotions. Over a span of time navigating your emotions, you may see a pattern start to emerge. Then you can decide whether the pattern is productive or unproductive. When parents rush to help, prevent mistakes, we deprive kids the chance to solve problems. We also send a message that we don’t trust them. For more amazing tips for emotionally intelligent parenting, check out Fights Well with Others: Tips for Collaborative Parenting. When our kids learn about their emotions and get their emotions validated, they start to trust their emotions. When we are honest about our own emotions and our own shortcomings, we open a pathway for communication with our kids and build the foundation for trust. From this trust comes… trust in self, trust in others, trust that their needs will be met, trust that they can effectively influence their world, and more. Practicing these tips to build trust as a parent is a lifelong gift to your children! May is a parent, a coach, and a change maker passionate about the power of emotional intelligence for helping families. Her noble goal is help parents discover their inner wisdom so that they can find more joy, calm, and connection with their kids. Very useful article. Many adults who have not developed high emotional intelligence could benefit from the tips offered. What a terrific resource for parents! And I love the printable poster!! Ill be sure to share this link this with other parents Mary!